Minister P. Harrison handing over a compensation payment to a farmer. Seventy four farmers affected by the Yan Oya reservoir project were paid Rs. 67 million in total as compensation, recently. About Rs. 900 million is to be paid as compensation to farmer families. Irrigation, Agriculture, Livestock Development, Aquatic Resources and Rural Economy Minister P. Harrison said the compensation payments would be completed before September. 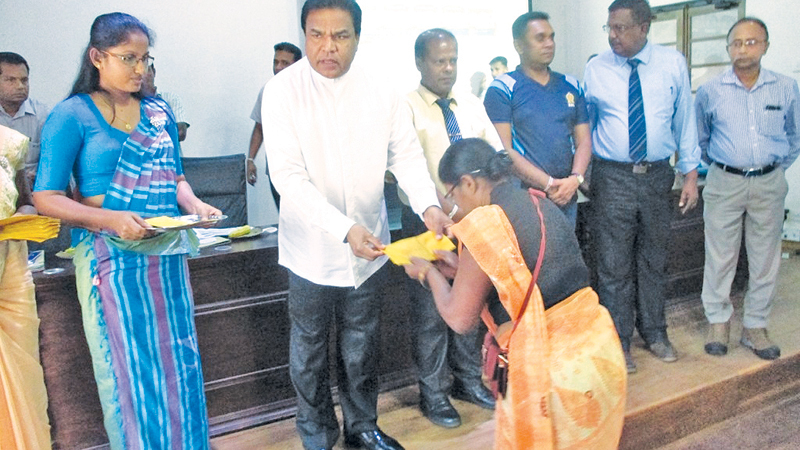 He was participating in the award of compensation to Yan Oya farmers at the Anuradhapura Kachcheri auditorium, recently. The construction work of the Yan Oya reservoir is to complete by September before the 2019/2020 Maha season. Nearly 4,000 hectares of land have been submerged to the Yan Oya reservoir. The project costs the government Rs. 36,000 million. It has been estimated that Rs. 5,000 million is needed to pay compensation to the evacuated farmer families to accommodate the reservoir project. The reservoir will have a capacity of 149,000 acre-feet of water, the minister said. The minister said once the Yan Oya reservoir is commissioned in September, water would be provided to cultivate 25,000 acres in Yala and Maha seasons. Under the Yan Oya reservoir scheme, farmers in Padaviya would obtain sufficient water through the reservoir’s left band canal, 20km in length, which runs up to the Padaviya Jayanthi Wewa for the first time since there was no permanent water source, other than rainwater, to feed the Padaviya reservoir bearing a capacity of 85,000 acre-feet. “We will start the construction work of the adjoining lower Malwathu Oya reservoir soon. The project costs Rs. 14,000 million. Both Yan Oya and lower Malwathu Oya reservoirs would solve the water scarcity in the Anuradhapura, Mannar, Vavuniya and Trincomalee districts,” Minister Harrison said.